This is a great time of year: Valentine’s Day is coming soon, and there are a number of festivals all over the world (here in Ottawa, Quebec City, and let’s not forget Mardi Gras and the Carnival in Rio in a few days. Seems appropriate then to listen to a comic opera involving some of those great elements: love, fun and general reveling in the context of an evening of dancing, encounters and the topsy-turvy world of a masquerade ball. 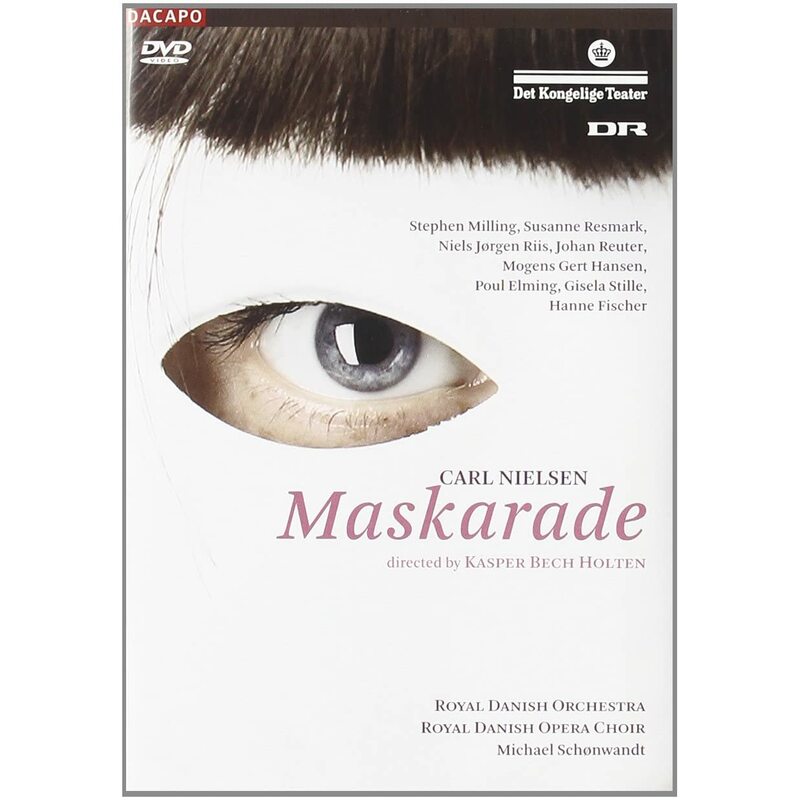 us, Verdi’s Un ballo in maschera and this gem of an opera from Denmark’s Carl Nielsen, Maskarade. This Nielsen opera is more aligned with the shenanigans of Strauss’ tale than Verdi’s murderous plot . The masquerade of the title is a place where the characters can leave behind the oppressed lives they lead in a rigid society; it represents liberty and the Enlightenment, and even more, perhaps, a sense of joie de vivre in a land where weather (and duty) is often cold and gloomy. Not surprisingly, Maskarade has become the Danish national opera. The action culminates at another masked ball, this time it is well-attended: Jeronimus and his wife, Leonard, a trio of servants… You get the picture! And, it goes without saying, the outcome of all of this not only proves that stars do indeed align, but that sometimes even in Opera, there can be a happy ending! libretto by V. Andersen after the play by Holberg. February 8 2013, "I Think You Will Love This Music Too" will feature a new podcast "A Montage of Second… Symphonies" at its Pod-O-Matic Channel. Read more February 8 on the ITYWLTMT Blogspot blog. I bought this DVD last month. Have not watched it yet. @HC: Beware of the stupid camera work. Otherwise, it's a good performance. Too many operas. Not enough time. Maskarade is really worth it, though. An utterly lovely opera. Except the 2nd act which could do some revising. But even that act has some very, very good moments. Aksel, your continuing enthusiasm for this opera is inspiring. I am going to have to investigate it. When I was at conservatory I was privileged to take part in a performance of Nielsen's Wind Quintet, and an orchestra I was in performed the First Symphony, which is still one of my favorite works: absolutely magnificent. I was just saying that there are so many good operas to listen to and not enough hours of the day to listen to everything. I sampled itywltmt's links yesterday and thought the music was really lovely. A couple of years ago I added English subs to a wonderful 1986 telecast of Nielsen's "Saul and David." The wind quintet is a lot of fun! Some friends of mine played a while ago. The variations movement is such a great little piece of musical characterisation. When I first heard the quintet, prior to performing it, the variations movement was instantly my favorite. The hymn theme has a lovely poignancy without being at all sentimental, and you are right: the variations are wonderfully characterised. Some of them are quite funny! Aksel, if you don't yet know Nielsen's First Symphony, you owe it to yourself to give it a listen. It is not on the level of his mature works and is still quite Brahms-influenced, but it combines great sweep and power with a quirky approach to melody and instrumentation that I think is unique in the symphonic repertoire. There are some passages that to this day still make me weep, but like the quintet, without a hint of sentimentality. It is rather the harmonic progressions and the sense of a great lonesome voice that are so moving, at least to me. Especially when you know about things like the relationship between the bassoonist and the clarinetist in the original quintet. They were always bickering, and the bassoonist always had to have the last word. And no, I haven't heard Nielsen's first symphony (love the fourth though). Will give it a listen! Nielsen's sense of melody is really rather unique. Oh, and just a slight quibble: While Grieg, Nielsen and Sibelius indeed were contemporaries, Nielsen and Sibelius were born over 20 years after Grieg. A more fitting contemporary Norwegian composer would be Johan Halvorsen (even though he's barely known outside of Norway). Though not well known to the general operagoing public, Maskarade is a gem of a comic opera ! It's one of the funniest, most exuberant, witty and joyous works in the operatic repertoire . Fortunately, it's starting to get the more of the recognition it deserves in recent years, with the superb Decca CD Da Capo live performances . I have the DVD , and don't mind the camera work . If you have not heard or seen Maskarade, get the DVD immediately ! You're in for a treat ! There are English subtitles, so don't worry about it being sung in the original Danish . Makarade deserves to be done by the Met . This would be cause for rejoicing, and I'm convinced the Met audience would love it ! I agree. I think Alek Shrader would be a wonderful Leander as well! That is wonderful that you subtitled an entire opera. It is a lot of work. I did it once. Took me several months in my spare time. I entered about 1250 subtitles and estimate it took me a good 80 hours total time, including figuring out which English translation (of two I had on hand) best fit each sequence I was working on. I probably did it the hard way, running about 30 seconds at a time jotting down times next to phrases on the liberetto. Some parts are pretty hard to subtitle, such as a duet or quartet. As for Nielson, I started with Saul and David some time ago then recently got Maskarade. That inspired me to check out the Nielson symphonies and may symphony set arrived today. A lot of fun exploring/learning about a composer new to me.